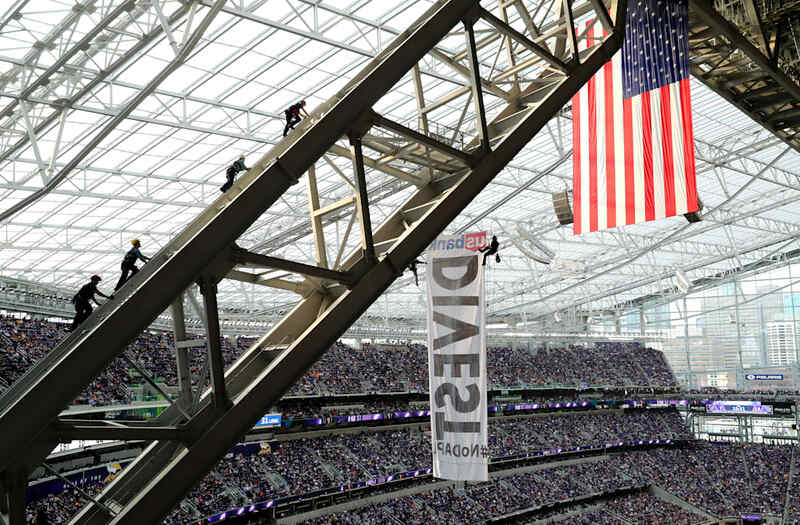 A strange scene unfolded during the Minnesota Vikings' Week 17 game against the Chicago Bears when North Dakota Access Pipeline protesters hung a giant banner from the rafters of US Bank Stadium in Minneapolis. The two protesters, one of whom was wearing a Vikings Brett Favre jersey, climbed to the rafters and unfolded a giant banner urging US Bank to divest from the controversial pipeline. According to Matt Vensel of the Star Tribune, media were emailed a press release during the game about the protesters. According to the release, the pipeline was supposed to be completed on this date, January 1, 2017. However, due to protests and controversy over the construction of the pipeline, it is still incomplete. The protesters said US Bank should divest their money in the project, claiming it will do harm to local communities while violating rights of the Standing Rock Sioux Tribe. The climbers reportedly used ropes and harnesses to get up to the rafters to hang the banner. Police began climbing up to remove the protesters. Police also cleared the seats right below where the banner was hanging.